Matt learned to play volleyball from his father while growing up in Ventura, California. During his time at Long Beach State Matt was a four year starting middle blocker for the 49ers. He was a freshman All-American (1998), 2nd team All-American (1999), and 1st team All-American (2000). Prosser graduated with a degree in broadcast journalism. Prosser reached is first ever final in 2010 with partner John Mayer at the Hermosa Beach AVP as the 13-seed. Prosser and Mayer beat the 2nd, 4th, 5th and 10th seeded teams enroute to the finals where they were defeated by Dalhausser/Rodgers. Prosser was also the runner-up at the 2010 U.S. Open of Beach Volleyball. 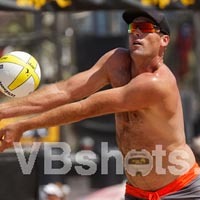 Prosser teamed up with former club volleyball teammate Matt Olson in 2011 and won the Huntington Beach AVP Championships tournament. It was Prosser's first career tournament victory. Matt and his wife Kristin met at an AVP event in Manhattan Beach (Kristin qualified and finished in 25th, and Matt finished in 9th) and married in 2012. Kristin played college volleyball at Northeastern University in Boston. Matt and Kristin live and work in Encinitas. Matt has been coaching volleyball for nearly 20 years and continues to teach the game to young athletes.